It's not just Ford and GM. There are numerous other types of vehicles, and numerous automotive suppliers to those OEMs who each have their own characteristics when it comes to warranty claims and accrual rates. From the look of the financial reports arriving for the second quarter of 2004, there is no end to the wide gap seen in warranty claims and accrual rates between automotive vehicle manufacturers and their component suppliers. While automotive OEMs such as Ford, General Motors, Caterpillar, Deere, Navistar, and Paccar continue to experience warranty claims and accrual rates in a 2% to 3% range, their component suppliers continue to report rates only a tenth as large. Obviously, warranty is not only a function of product quality, but also is a function of a company's place in the supply chain. Those closest to the customer see the highest rates, while those companies whose customers are other manufacturers tend to escape the bulk of the expense. It's probably a combination of contractual arrangements, inefficiencies in supplier recoveries, and the difficulty of pinpointing the cause of a specific failure and tracing it back to a given supplier's shipment. But rather than dwell on the "why," the balance of this column will detail the "what." For the past 18 months, Warranty Week has been tracking the warranty expenses of some 151 manufacturers involved in one way or another in the automotive industry. A year ago, we began breaking out the automotive industry into OEM and supplier sub-categories, and more recently we began detailing the warranty characteristics of specific classes of product. The source of the warranty expense reports are the Form 10-Q and 10-K statements filed by public companies with the U.S. Securities and Exchange Commission. Their motivation for doing so is adherence to the "FIN 45" disclosure requirements mandated by the Financial Accounting Standards Board, which became effective for all year-end 2002 financial statements. Foreign-based manufacturers, including those such as DaimlerChrysler with significant U.S. operations, are exempt from the reporting requirements. Of the 151 automotive manufacturers, we've classified 44 as OEMs and 107 as suppliers. The line between the two is far from definitive, however. Some companies manufacture both their own vehicles as well as components such as engines for other OEMs. Others are more generally suppliers to the OEMs but still find time to manufacture specialty vehicles such as fire trucks or golf carts. We could create a third category of OEM/supplier hybrids, but for the sake of simplicity we used a common sense rule to classify all of the vendors: are their brand names on the outside of the vehicle? As mentioned, the 44 OEMs generally experience claims and accrual rates in the 2% to 3% range. Anything above or below that band is unusual for an automotive OEM. Taken together, the aggregate claims and accrual rates of all the OEMs have been in an even tighter band of 2.4% to 2.8%, as the following chart details. The claims rate was highest during the third quarter of 2004, while the accrual rate has taken a noticeable upturn in 2004, perhaps in response to a rash of product recalls. But the scale of the chart had to be exaggerated in order to show this clearly. These trend lines are actually quite stable. The 107 suppliers, meanwhile, seem to be allowing the auto OEMs to hold the bag when it comes to warranty. By the way, when we say auto OEM, we mean much more than just passenger cars. Also included are all the U.S.-based manufacturers of trucks, buses, recreational vehicles, fire engines, ambulances, garbage trucks, construction equipment, farm equipment, riding lawn mowers, motorcycles, all-terrain vehicles, golf carts, and other types of motorized vehicles. Automotive parts suppliers, as the chart below details, typically see warranty claims and accrual rates in the 0.5% to 0.7% range. Take away the engine and drivetrain manufacturers and the sector's average would drop even further. The suppliers of automotive components such as brakes, mufflers, tires, shocks, interiors, sunroofs, lights, audio, climate control, glass, paint, and other vehicle components are more accustomed to seeing claims and accrual rates in the o.2% to 0.4% range. For some reason, the big drivetrain manufacturers such as Caterpillar Inc., Cummins Inc., Dana Corp., and ArvinMeritor Inc. don't follow the OEM vs. supplier model. As we shall detail later, they're seeing claims rates not far below those seen by the OEMs they supply -- perhaps in part because at least in the trucking business, some of them are supplying their own warranties directly to the customer. When Cummins sells an engine to Dodge for use in a pickup, the ultimate customer receives a Dodge warranty. But when a Cummins engine goes into a tractor-trailer, the customer receives their warranty directly from Cummins. To make the case as plain as possible, we've taken the data from four companies and assembled it into a single chart. In the chart below, the top pair of lines represents the combined warranty expense of the top two OEMs: General Motors and Ford. The bottom pair of lines represents their supplier spin-offs: Delphi and Visteon. We have eliminated the blue bars representing claims in millions of dollars, but we've kept the red and green color codes for the respective claims and accrual rates. It should be plain as day that there is a wide gap between the auto OEMs and their suppliers when it comes to the percentage of product revenue that each allots to warranty. In specific terms, Ford is around eight times as large as Visteon when it comes to auto product revenue. However, Ford's warranty claims are 200 times larger. Below is a top ten list for the automotive industry as a whole, chosen on the basis of automotive product revenue and ranked on the basis of claims rate changes over the past year. With few exceptions, it's easy to pick out the five OEMs and the five suppliers simply by looking at the percentage rates. If either the claims or accrual rate is above 2%, it's an OEM. If it's below 1%, it's a supplier. The greatest improvement in warranty claims rates from the midpoint of 2003 to the midpoint of 2004 was turned in by Caterpillar, which actually saw claims rise from $115 million in the second quarter of 2004 to $130 million in the second quarter of 2004. But because sales rose faster, the overall claims rate fell from 2.35% to 1.95%. That's the lowest it's been over the 18 months for which statistics are available. And notably, it's one of the first instances of an OEM falling below the 2%-to-3% band. As mentioned, the trucking industry is different from the passenger car industry in that engine manufacturers such as Caterpillar and Cummins typically issue their warranties directly to the customer. In some cases, the customer can choose among several engine suppliers, not to mention other components of the rig. Others included in the aggregate rates detailed below include Navistar International, Paccar Inc., Ingersoll-Rand Co. Ltd., and Oshkosh Truck Corp. Wabash National Corp. and J.B. Poindexter and Co. Inc. have yet to file their financial reports for the second quarter, though they are included in the five earlier quarters, and are represented in the latest round by a placeholding estimate based on past averages. In the bus industry, warranty practices are much like the heavy truck industry. Navistar is the major domestic player, but keep in mind that much of the industry consists of British imports, not to mention subsidiaries of the major passenger car manufacturers. Besides Navistar, the major players in the aggregates below include Thor Industries Inc., National R.V. Holdings Inc., Williams Controls Inc., and Collins Industries Inc. The major warranty providers of the RV industry include National R.V. Holdings (obviously), as well as Coachmen Industries Inc., Fleetwood Enterprises Inc., Monaco Coach Corp., Thor Industries Inc., and Winnebago Industries Inc. As was mentioned in last week's column, there is some crossover to the prefabricated and mobile home industry. Here we've used another common sense indicator to decide if the product is a mobile home or an RV: does it have a steering wheel? As readers can see, the highest warranty claims and accrual rates among the large vehicle types are seen by the bus manufacturer, while the lowest are seen by the truck manufacturers. RV manufacturers are somewhere in the middle. We didn't have enough data to graph other large vehicles such as garbage trucks, dump trucks, or farm and construction vehicles, but they generally fell within the same bounds. There are, however, five American manufacturers of a very specialized sector: emergency vehicles. These include fire engines, ambulances, and other vehicles found with flashing lights and sirens. Police cruisers, as vigilant speeders know, are usually special-built by one of the Big Three passenger car OEMs. No expense is spared, except for the hubcaps, which always seem to be items from the lowest of the low end. The top five providers of emergency vehicle warranties are Oshkosh Truck Corp., Federal Signal Corp., Spartan Motors Inc., Collins Industries Inc., and Rexhall Industries Inc. It's likely that a passenger car OEM such as Ford is spending more on police cruiser warranties than all of the above combined. But if we included them here, what follows would essentially become a graph of Ford's warranty expenses. As can be readily seen, the warranty claims and accrual rates for emergency vehicles is now well below the typical range seen by OEMs. After peaking at 1.5% in the fourth quarter of 2003, the claims rate slipped below 1% this year, as has the accrual rate (though it was always much closer to 1%). As for why this is so, we have no clue. Like RV manufacturers, the makers of fire trucks and ambulances are more like assemblers than manufacturers. But unlike RV manufacturers, those who make emergency vehicles spend a much lower percentage of their revenue on warranty. Finally, at least in terms of OEMs, we present the small vehicle category. This category includes not only the hogs of Harley-Davidson Inc., but also the ATVs and snowmobiles of Polaris Industries Inc. and Arctic Cat Inc., and even the motorized wheelchairs and scooters of Invacare Corp. Now that's a crossover you don't see every day: medial equipment and automotive! As mentioned, it's very different for automotive suppliers. Those who manufacture the engines, axles and transmissions see OEM-like warranty claims rates, but those who supply OEMs with the rest of the components see much lower rates. First, let's take a look at the drivetrain manufacturers. The data above represents the aggregate of 25 different manufacturers -- everything from the big diesels of Caterpillar and Cummins to the fuel injectors of Stanadyne Corp. and the camshafts of Park-Ohio Holdings Corp. As a group, they see claims and accrual rates in a 1.2% to 1.6% range, which isn't exactly OEM territory but which is noticeably higher than the likes of Visteon and Delphi. Finally, we're spotlighting a category that we don't really have a name for yet: brakes, shocks, and mufflers. They don't have much in common besides their tendency to be the first parts to wear out and require replacement. It's no coincidence that most aftermarket muffler shops also do brakes and shocks. So we're creating a category for the likes of Midas Inc., not to mention manufacturers such as American Standard Companies Inc. and Tenneco Automotive Inc.
We are omitting charts for automotive components such as tires, air conditioning, audio, and interiors. Readers who want the complete set can contact the editor by email. For those who simply need to know now, tire manufacturers typically see claims and accrual rates in the neighborhood of 0.2% to 0.3%, which is startlingly low given the government's choice of names for the TREAD Act auto safety effort. If the tires are failing as often as media reports suggest, it sure isn't showing up in these statistics. All U.S.-based automotive warranty issuers are represented in either Figure 1 or Figure 2. Some are repeated in Figures 5 through 11, as is appropriate to their respective product lines. The total amount of automotive-related warranty claims during the second quarter was $2.95 billion, essentially the same as in the first quarter. But keep in mind that some automotive vendors derive a significant amount of revenue from non-automotive product lines, and that all their non-automotive warranty claims are necessarily included in these charts. There was quite a large overlap between the aerospace and the automotive industry, with 16 vendors counted as both. Top manufacturers in both aerospace and automotive included Exide Technologies, Polaris Industries Inc., Sequa Corp., Teleflex Inc., and Textron Inc. There also was quite a large overlap between automotive manufacturers and both HVAC and electrical power equipment manufacturers, with 14 manufacturers crossing over to two or more lists. Automotive companies also in HVAC included A.O. Smith Corp., American Standard Companies Inc., Eaton Corp., Honeywell International Inc., Ingersoll-Rand Co. Ltd., and Johnson Controls Inc. Automotive companies crossing over into electrical power generation equipment included Briggs & Stratton Corp., the Carlisle Companies, Caterpillar Inc., Cummins Inc., and Regal-Beloit Corp. When a warranty isn't really a warranty: professional audio/video warranties actually cover very little. LandAmerica Financial Group Inc. acquires Buyers Home Warranty Company/Best Home Warranty Company, an administrator of home warranty contracts in the southern and western U.S.
Mercedes dropping free warranty period maintenance starting with 2005 models. Customers who used to get free service checkups, labor and many parts will pay for them individually or buy a maintenance package. Suzuki Motors' Indian subsidiary Maruti Udyog cuts warranty claims rate by 73.7% over five years; percentage of customers making claims during the warranty period declined from 37% to 26%. Declining product quality, imports from China, and a general tightening up of the rules on returns and warranty conditions are impacting New Zealand's computer resellers. Australian builders take to the streets to protest against a seven-year-old law mandating a privatized home warranty system. Volkswagen lengthens its usual five-year, 50,000-mile warranty to eight years with no mileage limit on repairs related to oil sludge in certain Passat and Audi models. State of New Mexico and contractor bicker about warranty on highway between Bernalillo and Farmington. Chrysler won't ship warranty replacement parts for the multiple displacement system (MDS) Hemi V-8 engine to a dealer until its service staff calls Chrysler engineers to report symptoms and pinpoint problems. Maxtor rethinks warranty to stay competitive, lengthens term for entry-level hard disk drives from one year to three. Piercing warning tone in Siemens 65 mobile phone could damage hearing; Siemens Mobile halts sales and several operators offer trade-ins; analyst predicts problem could cost 50 million euros to fix. Owner of a rear projection TV reports that History Channel logo and others carried in lower right corner of the screen have permanently burned themselves into his screen, and his warranty won't cover the repairs. Philadelphia area TV repairman John Giangiacomo surrenders to police, accused of deceptive business practices and theft for refusing to repair and/or return broken TVs to customers, some of whom had bought his extended warranties. Warrantech Corp. files Form 10-K for fiscal year ended March 31, shows net loss of $516,371 and predicts continuing losses until fiscal 2008. NHTSA is investigating Ford Focus for door latch problems; company counts 28 warranty claims for rear door latch failures. NHTSA upgrades its investigation into ball joint failures on 2002 Toyota Tundra pickup trucks; cites 28 warranty claims for lower ball joint wear. Former warranty administrator at J.D. Byrider in Louisville, Kentucky alleges the dealership gave special trade-in deals to the former head of the attorney general's consumer affairs office in return for leniency with complaints. Dell's secret earnings engine is extended warranty contract sales: 6% of total revenues, 13% of gross profit, and 28% of operating profit. Arizona Attorney General Terry Goddard amends lawsuit against Second Chance Body Armor, accused of knowing as far back as 2001 that bullet-proof vests made with Zylon age rapidly in humidity, heat and sunlight. AWKnowledge reports exclusively that Mercedes will lengthen electrical system warranties. AWKnowledge reports Mercedes has denied it plans to lengthen electrical system warranties. Red Bend Software to supply Sony Ericsson Mobile Communications and Siemens Mobile with over-the-air software update technology for handsets that transmits new features and security patches; helps mobile operators avoid recalls and warranty claims. TH Lee Putnam Ventures and Freeman Spogli & Co. take a "significant" equity interest in extended warranty administrator N.E.W. 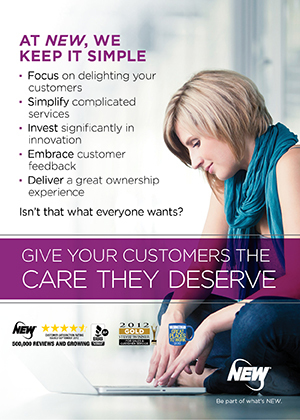 Customer Service Companies Inc., valuing the company at $370 million. Novak Biddle Venture Partners sold a portion of its N.E.W. investment to TH Lee Putnam Ventures, but will hold onto the remainder. Raytheon Missile Systems to provide U.S. Navy with new Block IV Tomahawk cruise missiles carrying a 15-year warranty, up from current model's eight-year duration. Public Citizen asks for investigation of Home Buyers Warranty Corp. and Construction Arbitration Services; claims firms are insisting on home warranty arbitrations even in states where they're prohibited. Colorado Insurance Commissioner orders an investigation of Home Buyers Warranty; Denver-Boulder Better Business Bureau says company has an "unsatisfactory record . . . due to unanswered complaints." Seagate's recent five-year warranty announcement is doing wonders to its hard drive sales in Mumbai, with a survey of Lamington Road dealers revealing sales increases of 60% in some cases. Ilog Inc. says Entigo Corp. has incorporated Ilog JRules into Entigo Warranty 4.1, creating an automated claims processing solution that is expected to eliminate the need to manually process up to 90% of claims. Toyota Motor Sales U.S.A. Inc. and JM Family Enterprises Inc. to donate $1 million to Hurricane Charley relief efforts; Palm Toyota dealership in Punta Gorda, Fla. was destroyed by the storm. Buying OEM hard drives at retail, while saving money, carries perils: no warranty and no upgrades. Advanced Micro Devices lengthens warranty on Opteron microprocessors from one year to three. ClearForest Corp. announces Text Analytics 6.0, business intelligence platform can analyze enterprise data and unstructured text such as call center records, technician service notes, contracts, and product warranty claims. Country manager for Seagate in India explains strategy behind new five-year hard drive warranties. S.H. Brown employs 10 "mystery shoppers" who pose as customers but report back to manufacturers about auto dealer sales pitches, compliance with disclosure requirements, and sometimes even warranty fraud. Deborah P. Majoras appointed chairman of the Federal Trade Commission; recess appointment sidesteps Senate objections. Select Comfort Corp. sees its shares sink to a new 52-week low after Minneapolis TV station airs report about mold growing in mattresses, company responds with data showing less than 1% of customers file warranty claims. Attensity Corp. named company most likely to succeed at Aug. 10 Silicon Valley venture capital event focused on the enterprise search market. Honda Motor Co. Ltd. discloses leak of 40,000 used car warranty service customer records, but concludes it extended no further than one employee of temporary labor firm working at home. Armor Holdings Inc. settles class action lawsuit brought by police using ABA Xtreme VX Vests; will exchange old Zylon vests with new models but warranty will be 30 months instead of 60. EBITDA and pro forma earnings calculations are vulnerable to distortion; companies can over- or under-accrue for warranty to paint a misleading earnings figure. A.M. Best Co. assigns a financial strength rating of "B++" (Very Good) to London General Insurance Company Ltd. with a stable outlook, cites its strong market position as a warranty insurer in Europe. Illinois Attorney General pursues Alpine Auto Group and co-owners Jeffrey Star and Joe Demarco for allegedly selling extended warranties on used autos but then pocketing the premiums. Mitsubishi Motors North America CEO Finbarr O'Neill says he'll de-emphasize financing incentives and will limit the product line, but will emphasize warranty in an effort to turn around sales plunge. CDI begins offering three-year extended warranties on refurbished computers. Law firm Kimmel & Silverman opens office in Owings Mills MD, offering lemon law and breach of warranty assistance to Maryland drivers. Aerus Electrolux vacuums sell for between $799 and $1,999, with warranties up to 25 years, and soon will be selling at retail outlets, alongside new line of air purifiers and water purification line too. Consumer groups skeptical of new Texas Residential Construction Commission Act, which requires a dispute resolution process and sets warranty standards for the homebuilding industry. Goodyear credits the "buzz in the market" surrounding the new Assurance tire for its return to profitability; CEO says consumers seem impressed by its 80,000-mile tread-life limited warranty.